On the twelfth day of Christmas, we want to give to youuuuu…. Vancouver, we love you coasters! Someone let the Vancouver, we love you crew get crafty and after an epic day of crafting, baking, and eggnog martinis (delicious!) 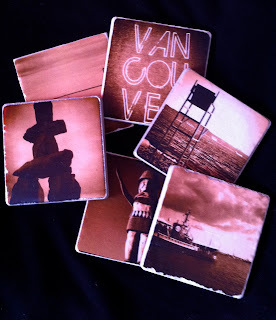 we ended up with some adorable Vancouver coasters! All the pictures were taken around the city and showcase some of the best Vancouver landmarks. They make a great gift for any Vancouver lover, and are an excellent pairing to our Vancouver, we love you shirts and other items. These beauties are not for sale but we wanted to give you the chance to get your hands on your very own, one of a kind, Vancouver inspired coasters. Here are the three ways you can enter to win a set of four (4) Vancouver, we love you coasters. 1. Leave a comment on this blog with your favourite holiday traditions (music to listen to, movies to watch, activities, etc). We always enjoying hearing why people love this time of year! 2. 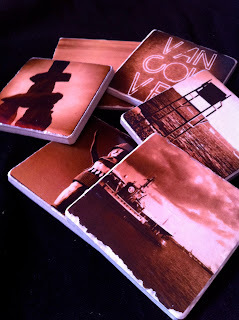 Follow us on Twitter and tweet the following phrase: I entered to win a set of 4 #Vancouver coasters via @VANweloveyou http://tinyurl.com/765ga9r #VANweloveyou RT to enter!! 3. "Like" our Facebook page and tag yourself in our contest photo on our wall. Contest closes December 16, 2011 and winner will be notified at that time. *Coasters may differ from the photo. My fav xmas traditions are drinking Bailey's by the fire along with my mother's choc chip cookies, watching Home Alone, and hopefully also watching snow falling outside! Decorating the tree and wrapping all the presents.. everyone gets me to wrap their presents because i love it so! Wow, I LOVE these coasters! This time of year is all about the family, friends and food! On Christmas day, we will have classic holiday movies on in the background: Miracle on 34th Street, It’s a Wonderful Life, and Frosty the Snowman. As a kid, it was fun going to the Christmas tree farm to chop down the tree. Decorating the tree and making a gingerbread house!